Handle: Silk-wrapped ray (ito wrapped same) with Damascus steel tsuba, collar (fuchi) and buttcap (kashira). Copper seppa (fileworked spacers). Sheath: The Saya (wooden sheath) is sculpted from Eastern hard curly maple and water buffalo horn. Description: Rarely is there a piece that is so substantial from an up and coming maker. 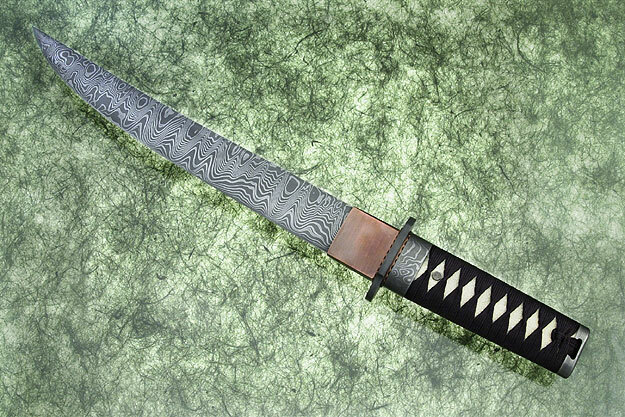 In this dress tanto, Lonnie has created a true work of art that would be the pride of any master. All Damascus steel fixtures are forged by Lonnie. 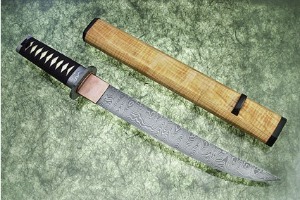 Even the mekugi (peg) is Damascus on this piece that can be fully dissassembled piece. 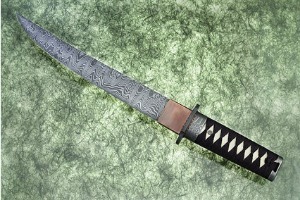 This is the first knife he has made with all his Damascus. 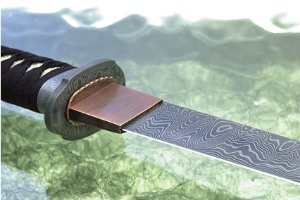 Every aspect is meticulous, from the silk wrap to the Damascus itself. Lonnie has selected 1084 and 15N20 as his steels of choice because they create an optimal amount of carbon for excellent edge retention. 0.0791015625 0.0634765625 79.1015625 63.4765625 Header Started. 0.4853515625 0.125 485.3515625 125 Trailer Started. 0.9072265625 0.421875 907.2265625 421.875 Trailer Completed.